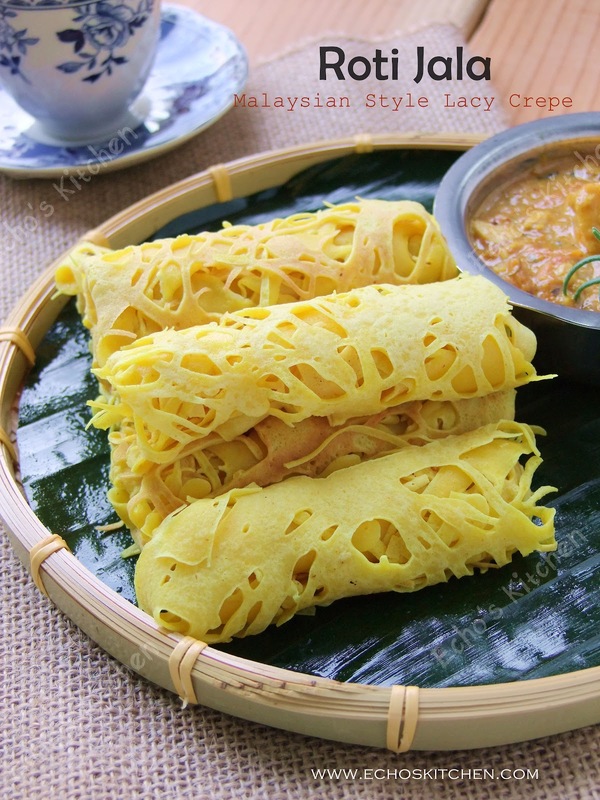 Roti Jala is traditionally eaten with Mutton or Beef curry, I made this Malaysian net crepe to go with my Mamak Mutton Curry. I do not have the mould to make this Roti Jala, so I made one using a disposable cup, and it works just fine! 1. 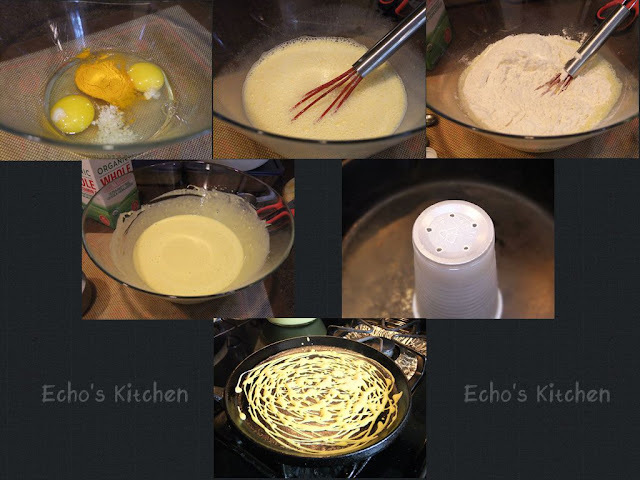 Whisk together eggs, milk, water, turmeric powder and salt, add flour and whisk until smooth, leave it aside for 20-30 minutes. The batter should be of the consistency of French crepe. Note: Try pouring the batter into mold, if it drips, the batter is too thick, add 1-2 tbsp of water, the batter should fall out smoothly. 2. Lightly grease a griddle or frying pan on medium-low. Pour around 1/2 cup of batter into the mould. Move the mold in circular motion to form lacy pattern. Cook for 2 minutes until set, DO NOT NEED to turn the crepe. Serve with any type of curries of your choice, I liked mine with Mutton curry. Where there's a will, there's a way! Especially when its Malaysian food!! few sad dry-looking specimens I have seen and tasted lately! and all food-sellers are cutting food costs and its showing in the taste now. better to start doing DIY like you! Quality of Hawker food is really down now but prices are shooting up! Enjoying reading your Blog and thank you for sharing too. it is such a sad thing to hear this, over the years, I have always feel disappointed eating back home in Malaysia, considering how excited I was to eat what I missed being out of Malaysia so long. But then like I said, i was greatly disappointed, I always attribute it to the change of my taste buds... looks like it isn't then. 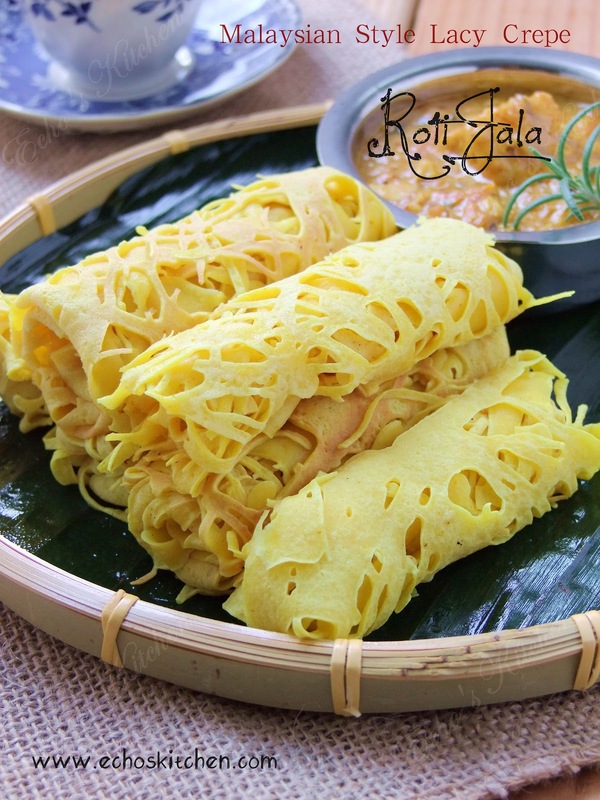 Hi, your roti jala look delicious. Nice picture. I love this too with curry chicken. Thank you Amelia very much! !